Two days, over 100 authors, some 200,000 visitors. 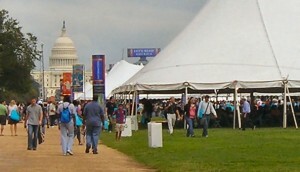 That was the 2011 National Book Festival in Washington, D.C., the eleventh annual celebration of the book and author originally launched by former librarian Laura Bush. Spread over two days for the first time, the Festival also featured new pavilions, including “Let’s Read America” and one devoted to graphic novels. Part of what I like best about the National Book Festival is the unique opportunity it presents to do lots of quick interviews in a very short period of time with a virtual all-star literary team. After the jump, listen to our Eye on Books “drive-by” interviews at the 2011 National Book Festival, and see our photo gallery! Russell Banks – The author of more than a dozen works of fiction, Russell Banks’ newest novel is “Lost Memory of Skin” (Ecco). His work has been translated into more than 20 languages, and two of his novels have been adapted into award-winning films: “The Sweet Hereafter” and “Affliction.” His novel “Cloudsplitter” depicts the fictionalized journey of abolitionist John Brown. Banks has written poems, essays and stories for The Boston Globe, The New York Times Book Review and Harper’s, among other publications. His novel “The Darling” will be directed by Martin Scorsese and star Cate Blanchett. Louis Bayard – The Washington Post says Louis Bayard has ascended to “the upper reaches of the historical-thriller league.” He has been an Edgar and Dagger award nominee and his novel “The Pale Blue Eye” has been optioned for a film. Set partly in Washington, D.C., his newest novel, “The School of Night” (Henry Holt), offers “seamless prose and conjures the past with credibility,” said The Wall Street Journal. Bayard is also a reviewer and journalist who has written for The New York Times, The Washington Post, Salon.com and other publications. Cassandra Clare – Born in Tehran, Iran, to American parents, Cassandra Clare spent much of her early years traveling the world with her family, including a trek through the Himalayas as a child who spent a month living in her father’s backpack. Her unique brand of fantasy fiction has earned her a worldwide audience of adoring fans. Tomie DePaola – More than 250 books feature the name Tomie dePaola as the illustrator, writer or both. He has been published for more than 40 years and has sold more than 15 million books worldwide. He was also the United States nominee in 1990 for the Hans Christian Andersen Award in illustration. Eric Dezenhall – Eric Dezenhall is CEO of Dezenhall Resources, a communications firm with expertise in damage control. He is also an author of books of nonfiction (“Damage Control: How to Get the Upper Hand When Your Business Is Under Attack”) as well as fiction (“Spinning Dixie”). He has written for The New York Times and USA Today, and he contributes regularly to The Daily Beast and The Huffington Post. His newest nonfiction work is “The Devil Himself”. Ciji Dodds – As Miss International 2011, I hope to be an advocate for the billions of adults and children who are struggling with illiteracy. I hope that you all will follow my journey. I have been blessed with an amazing opportunity and I hope to be a blessing to others. Rita Dove – In 1993 Rita Dove was appointed Poet Laureate of the United States by the Library of Congress, making her the youngest person — and the first African-American — to receive this honor; she held the position for two years. Bob Edwards – Bob Edwards is the host of “The Bob Edwards Show” on Sirius XM Radio and “Bob Edwards Weekend,” distributed to public radio stations. Both programs feature in-depth interviews with newsmakers, journalists, entertainers and other compelling figures. Before joining Sirius XM in 2004, Edwards hosted NPR’s “Morning Edition” for 24 years. Gregory Maguire – Gregory Maguire is the author of more than a dozen novels for children and many novels for adults, including “Wicked,” the basis of the smash Broadway musical of the same name. Formerly a professor of children’s literature at Simmons College, he is a co-founder of the Foundation for Children’s Books and of Children’s Literature New England Inc. Maguire is also one of the writers of “The Exquisite Corpse Adventure,” an original story written for the Library of Congress’ Read.gov website and now a book from Candlewick. His latest novel is “Out of Oz: The Final Volume in the Wicked Years” (William Morrow). Terry McMillan – “Waiting to Exhale” garnered national attention and a rabid following for its author, Terry McMillan, in 1992; it became a film in 1995. The following year, “How Stella Got Her Groove Back” was also a smash hit that told the tale of a woman who takes a trip to Jamaica and meets a man half her age. “Getting to Happy” (Viking) is the long-awaited sequel to “Exhale.” It reunites its predecessor’s characters – now in their 50s – who live in Phoenix and are struggling with their midlife crises. Julianne Moore – Julianne Moore is a four-time Academy Award-nominated actress and the New York Times best-selling author of three books about Freckleface Strawberry, a character inspired by her own childhood experiences. She is also an avid reader, a literacy advocate and the mother of two young readers. Sara Paretsky – When detective V.I. Warshawski debuted in 1982 in “Indemnity Only,” its author, Sara Paretsky, created a sensation by creating a female investigator who uses her wits as well as her fists. Paretsky challenged a genre in which women typically were either vamps or victims. “Body Work” (Putnam) is the latest in the V.I. series. Paretsky has broken barriers in other ways, such as when she founded Sisters in Crime, a worldwide organization that promotes women crime writers, which earned her Magazine’s 1987 Woman of the Year award. Esmeralda Santiago – Esmeralda Santiago emigrated from Puerto Rico to the United States with her family when she was 13. Her writing career evolved from her work as a producer-writer of documentary and educational films. Her essays and opinion pieces have run in The New York Times, The Boston Globe, House & Garden and Sports Illustrated. Upon publication of her first book, the memoir “When I Was Puerto Rican,” Santiago was hailed as “a welcome new voice, full of passion and authority,” by Washington Post Book World. Her new novel is “Conquistadora” (Knopf). Neal Stephenson – Neal Stephenson is the author of the three-volume historical epic “The Baroque Cycle” (“Quicksilver,” “The Confusion” and “The System of the World”) and the novels “Cryptonomicon,” “The Diamond Age,” “Snow Crash,” “Zodiac” and “Anathem.” Last year, Stephenson introduced “The “Mongoliad,” a fiction project distributed primarily as a series of apps for smartphone. Stephenson’s new novel, “Reamde” (William Morrow) is the story of a wealthy tech entrepreneur caught in the very real crossfire of his own online fantasy war game. James Swanson – James Swanson, who shares Abraham Lincoln’s Feb. 12 birthday, is the author of the New York Times best-seller “Manhunt: The 12-Day Chase for Lincoln’s Killer,” upon which the young people’s version, “Chasing Lincoln’s Killer,” is based. Swanson has written for The Wall Street Journal, Smithsonian and the Los Angeles Times, among other publications. He serves on the advisory board of the Ford’s Theatre Abraham Lincoln Bicentennial Campaign and also on the advisory committee of the Abraham Lincoln Bicentennial Commission. “Bloody Crimes: The Chase for Jefferson Davis and the Death Pageant for Lincoln’s Corpse” (HarperCollins) is Swanson’s new book.